Serve your lunch time sandwiches on this fine Czech porcelain rectangular Minuet pattern sandwich tray. 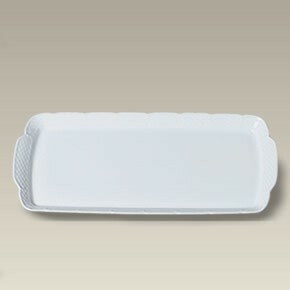 The 14.25" long tray has an embossed basket weave pattern along its edge. It contains a designer back stamp. Matches items 7443 & 7444. Made in the Czech Republic. Microwavable and dishwasher safe.